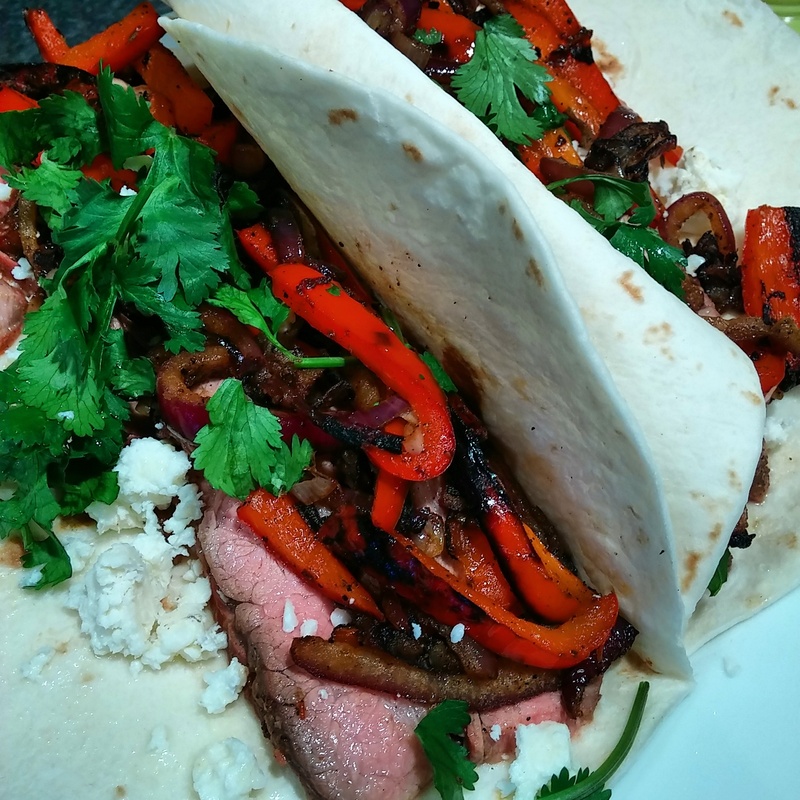 There’s no random story here, just a tasty recipe for some spicy flank steak tacos. This could be good recipe for Cinco de Mayo – you might want to bookmark this one for next week. Combine all of the ingredients for the marinade, except the cilantro, in a food processor or blender. Puree the ingredients until they are well-combined. Remove the steak from it’s packaging, and place it in a large ziploc bag or a large bowl. Pour the marinade and the chopped cilantro into the bag or bowl, and flip the steak until it is coated with both the liquid and the fresh herbs. Allow the steak to marinate for at least 30 minutes, but not more than an hour or so. In the meantime, slice the peppers and onions to your desired thickness, toss them with the oil and spices, and let them sit for a bit. Trust me, it’ll make ‘em more delicious. I prefer a really thin slice on veggies like this, so I have a fine-mesh grill basket that allows me to cook them without worrying about them falling through the grates. If that is a concern for you, you can always cut the veggies into larger pieces, or saute them on the stove instead of the grill. Grill the steak to your desired doneness, which if you’re a human with taste buds and common sense, should be a juicy, succulent, mid-rare at the very most. Unless – of course – you enjoy wasting the money that you spent on steak. In order to reach a healthy mid-rare, the steak should take no more than 4 minutes per side if grilled on medium-high. Crank the heat to high, and grill the peppers and onions, either directly on the grill or in a grill basket. Turn the veggies frequently to avoid burning them, a little char adds flavor but anything more turns your garnish into floppy, moderately-spiced charcoal. Cook the onions to your desired doneness, which for me takes about 4-5 minutes on the grill. Coincidentally that’s about the amount of time that you should be letting the steak rest after removing it from the grill. Slice the steak – very thin – against the grain. Not paper thin, just thin. Don’t say “paper thin,” it’s annoying. Build each taco on a tortilla with some thin-sliced steak, a scoop of peppers and onions, some crumbled cotija cheese, a pinch of fresh cilantro and a squeeze of lime. Oh yeah! This looks great!